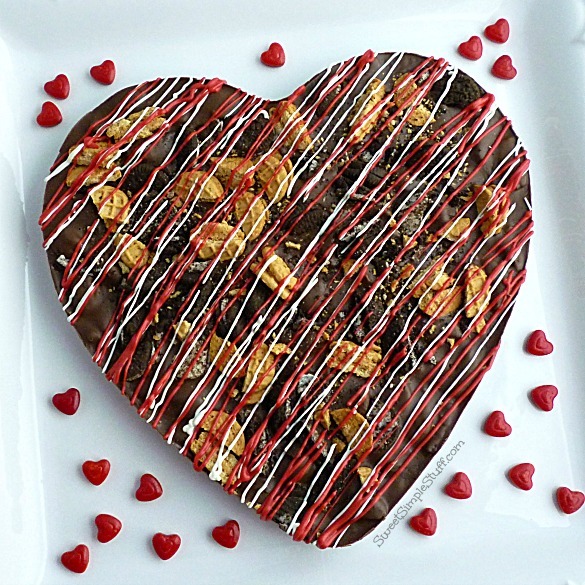 Cookie Lover’s Chocolate Bark in a Heart … Giveaway, too! Several weeks ago, I was knee-deep in chocolate! 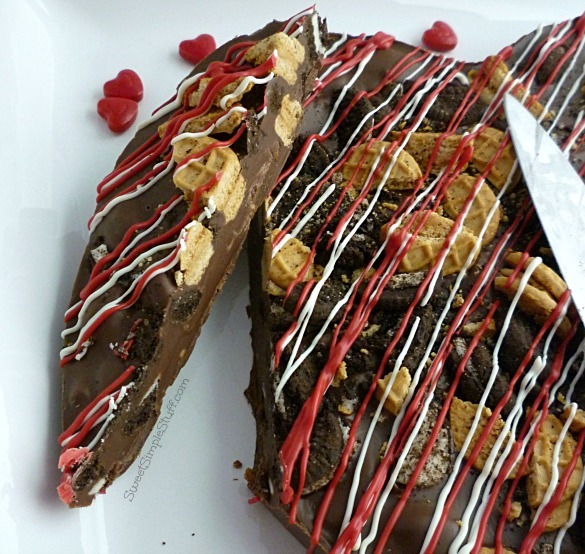 It seemed like all I did was make candy … hubby even learned how to make bark! We went thru about 30 pounds of chocolate plus all the nuts, caramel bits, peppermint, etc. I still can’t believe the amount of candy we made for co-workers, neighbors, friends and family. You know that some taste testing was going on too! Two evenings before Christmas, panic set in … down to my last two pounds of chocolate CandiQuik and had to make something for Son #3 to take to work in the morning. I was too tired to go the store … scoured the cabinets for something to use for a quick bark. I decided on Cookie Butter, Oreo Minis and Nutter Butters Bites in chocolate CandiQuik. According to Son #3’s coworkers and family taste testers, the experiment was a success! 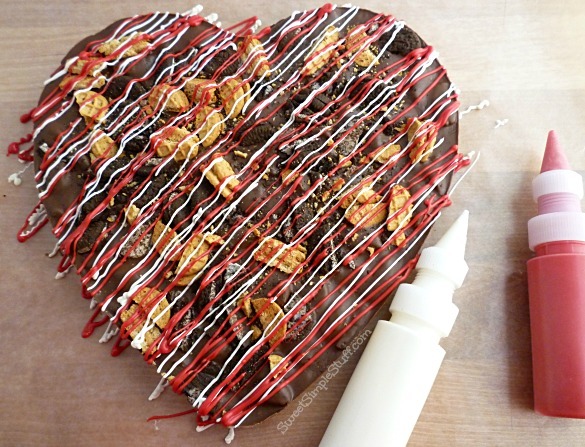 Today I made Cookie Lover’s Chocolate Bark in a Heart just in time for Valentine’s Day. 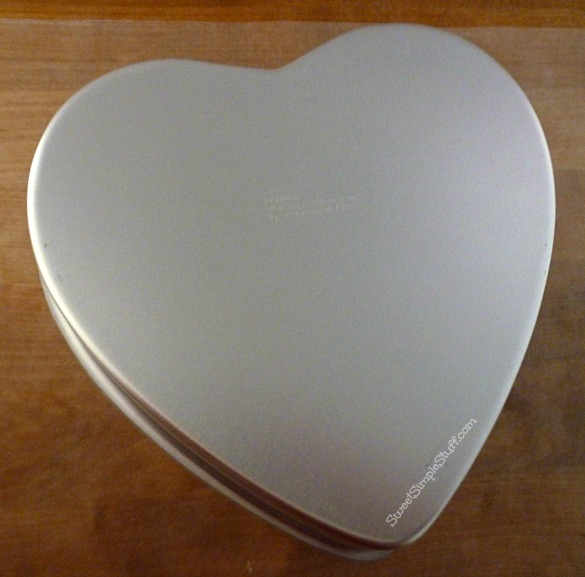 Oh yeah, I bought an extra heart-shaped pan to Giveaway, too!!! 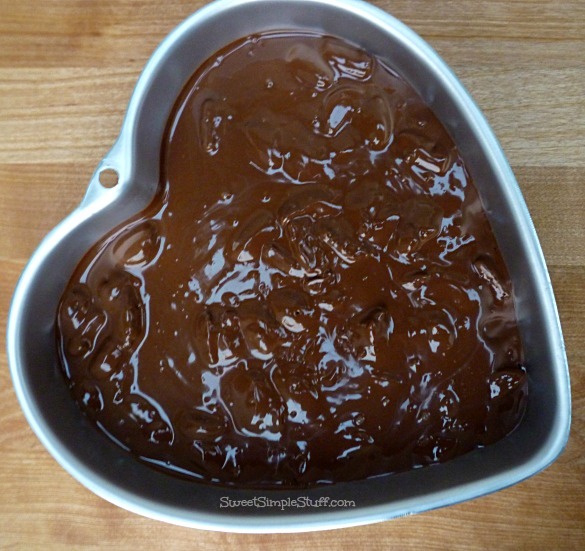 Have you ever molded chocolate in a pan that is usually used for baking cakes? Well, if you haven’t … you should … easy peasy … one large hunk of chocolate looks rather impressive, too! There are many reasons that you should try this recipe … smooth chocolate, cookie butter and crunchy cookies, just to name a few! 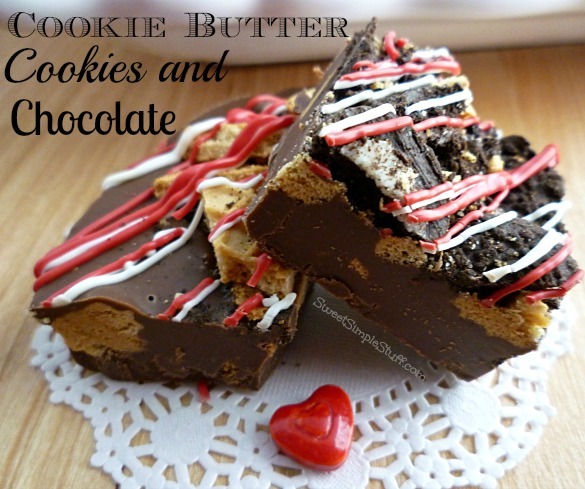 The addition of cookie butter to chocolate not only tastes great, but it makes the chocolate a little softer. The chocolate is not as soft as fudge, but soft enough to cut with a knife. Add cookie butter to melted candy and stir until well combined. 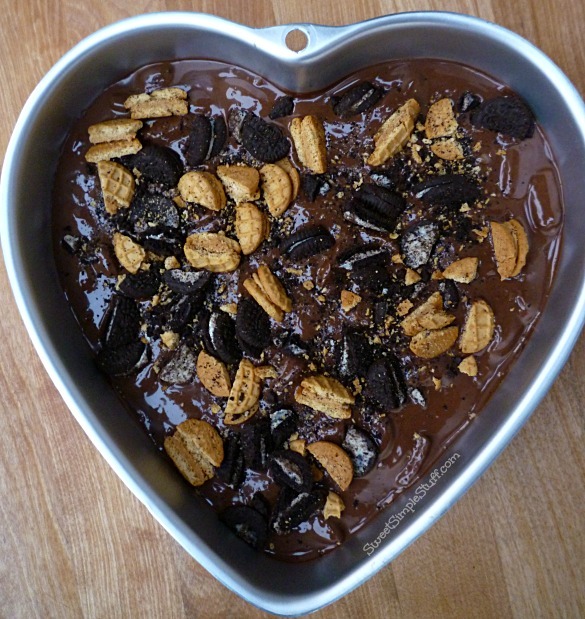 Stir one half of cut up cookies into chocolate mixture and pour into heart pan. (Do not grease pan). Sprinkle remaining cookies and crumbs on top of melted chocolate and tap on counter to smooth out mixture. Give a little press on the cookies to be sure that they are touching the chocolate. Place pan in the refrigerator until firm and cool (30-60 minutes). Remove pan from the fridge, cover with a sheet of waxed or parchment paper (this will help catch any loose cookie crumbs and you will use it when decorating). Carefully, flip the pan over on the paper. If the candy doesn’t come out on its own, give a little push on the bottom of the pan. After the red and white drizzle has hardened, remove heart from paper, break off any excess drizzle. Place on a flat serving plate/tray/cutting board. To prevent the candy heart from moving on the plate, use a little melted candy under the heart to attach or glue it to the plate. Hint: To make the bark without using a pan/mold … simply make it on a wax or parchment paper lined tray. I ♥ heart shaped pans! They’re very useful and versatile, just like round, square and rectangular pans. Heart shapes can be used to create a butterfly, mouse face, ladybug and puppy face just to name a few! 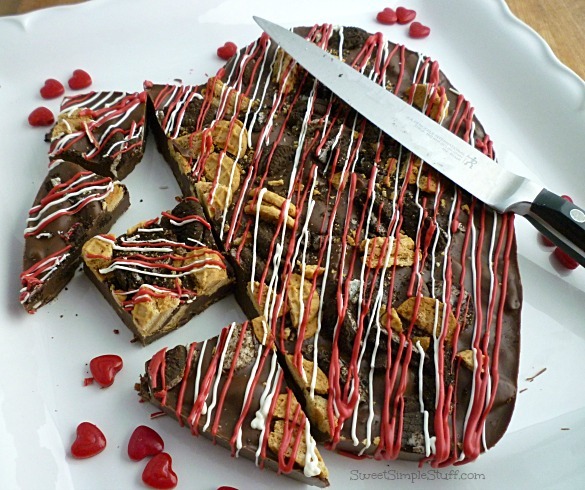 Make Cookie Lover’s Chocolate Bark … bake a cake or brownies! This pan is about 9″ x 2″ and has instructions for use. My love of spatulas continues … found a cute Valentine’s Day silicone spatula, too! 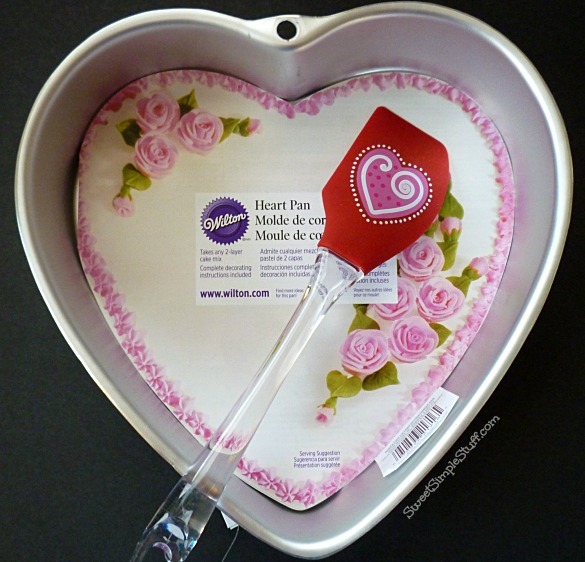 I’m giving away this heart pan and spatula to one lucky person! How to enter for a chance to win these fun Valentine’s Day supplies! What have you used a cake pan for, other than baking a cake … or … do you have any ideas to share? I’ve seen stepping-stones for the garden using a pan to mold the stones, but never tried it! One entry per person. Giveaway open to U.S. residents only. Deadline to enter is Sunday, January 25, 2015 at 11:59pm PST. The giveaway has ended. One winner will be chosen at random and announced here on Monday, January 26, 2015. A winner has been chosen using Random.org … the lucky winner of the heart pan and spatula is comment #8 – Colleen B from Texas! I loved reading all of the comments! Our cake pans sure work hard … maybe we should call them multi-purpose pans! What have you used a cake pan for, other than baking a cake … or … do you have any ideas to share? Don’t be shy! I often use my pans to make chocolate. 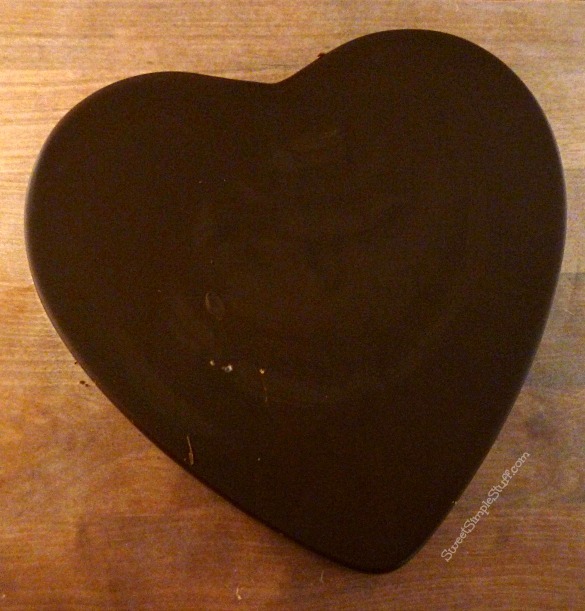 I’ve created chocolate boxes using the heart pan. I pour thin layers of chocolate in the pan to make a top and bottom. Then I use modeling chocolate to create the sides of the box. I fill the boxes with smaller chocolate pieces. I just bought some 6 inch heart pans, but could sure use a 9 inch pan too. I have used my cake pans for carrying some beads for my girl scouts! I have also used my pans to help make ice cream cupcakes! Can’t wait to see all of the other uses! I love using a different variety of cake pans as jello molds – I know – but I love jello. 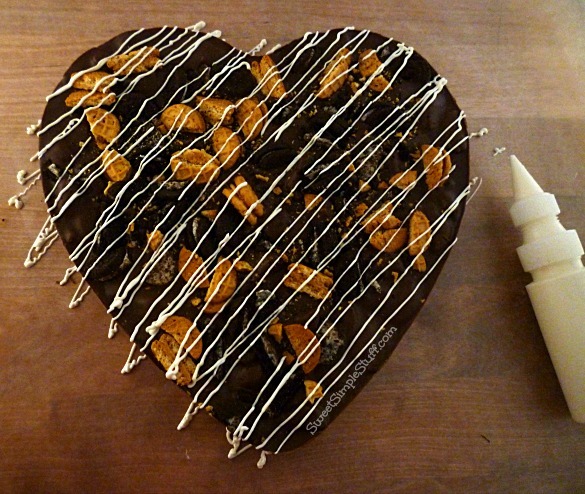 I love your chocolat heart! 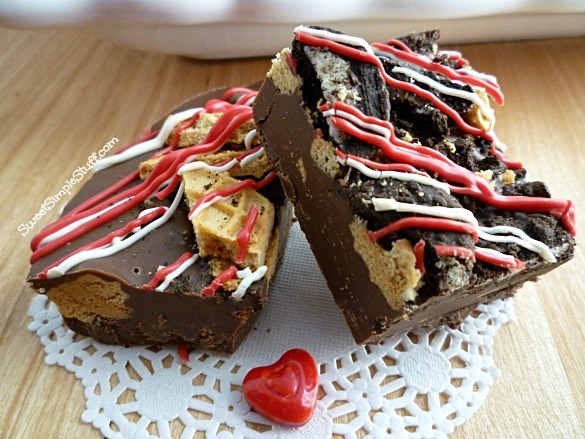 It is gorgeous and I am sure any chocolate lover would love to take a bite out of it. I know I would! I have used my heart shaped pan for fudge and rice krispie treats. LOVE the hearts! I’ve used a pumpkin shaped pan to make a giant chocolate chip cookie (2 pillsbury packages) decorated with orange icing. I have used cake pans to make French bread pizza in the oven before when I couldn’t find the pizza pan. Absolutely love the cake pan and that cute little spatula. Oh, goodness, where do I begin when it comes to using my pans besides making cakes. Will give several ideas . Spray paint and Decorate, add favorite photos inside each muffin cup and make into a great keepsake and hang on the wall. (I buy old, used muffin pans at resale shops, GoodWill stores, garage sales; anywhere I can find them cause they are so handy for so many things. I’ve done the stepping stones in a baking pan thing! It works! 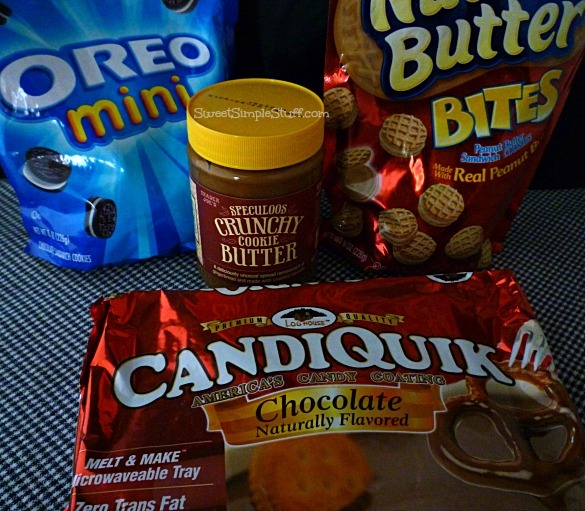 I must be the only one who doesn’t know what cookie butter is 😦 Now that we have a Trader Joe’s, I’ll have to go look. I like the idea that your heart is cut-able as a result of adding the cookie butter. Bark done the reg. way has a tendency to shatter. 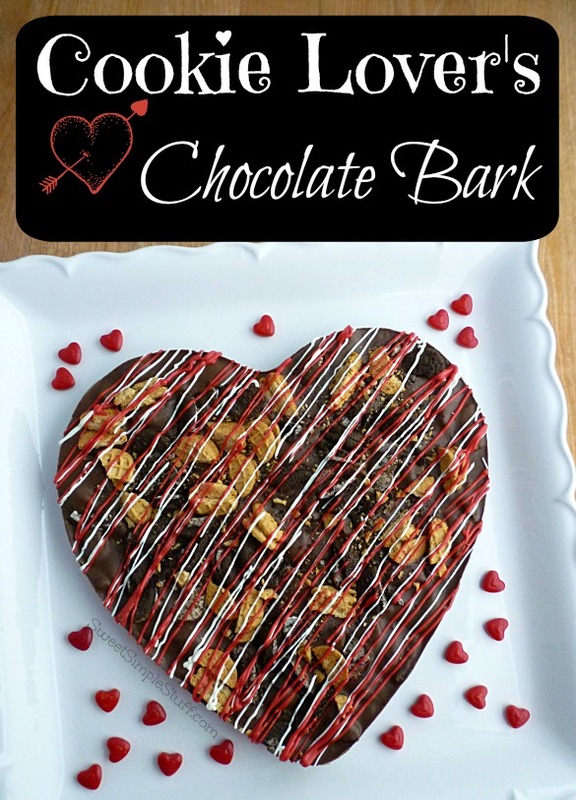 When giving bark to a family it’s so time consuming to make each person an individual bag of something so the heart pan for Valentines day or a tree pan at Christmas is sounding pretty good. Making giant ice cubes in a muffin tin is a fantastic idea. During hurricane season we usually make really giant ice cubes in a milk carton but I suppose a cake pan would be good also. Fun to see what others are doing with their pans so glad you asked the question. Brenda, love this idea and it is adorable and perfect for this upcoming Hallmark holiday. Sharing!!! I use cake pans to sort loc bloks, screw and nails and parts for assembling items. I have used my cake pans for numerous baking needs. I use them for homemade cinnamon rolls and dinner rolls. Rice Krispy treats! Cake pans definitely come in handy. I once used small cake pans to make sun-catchers by melting pony beads in them. I tried to use a square cake pan to make raspberry strudel bars but they didn’t come out easily – should’ve lines the pan w/ foil! I have used cake pans for toasting nuts and other things, like bread crumbs. I have used a cake pan for deep dish pizza. Would look cute with a heart! I use cake pans for baking half a recipe of a casserole if my 8 x 8 pan is dirty. I’ve used them for making cookie bars and caramel. I’ve only used them for cakes, but I thought about trying to use them for a huge cookie! LOL Thanks for the giveaway! I use my cake pans to make Rice Krispy treats & also granola bars! I use cake pans to toast pumpkin seeds.